I frequently get asked if there are any foods that were my favorite growing up that were not vegan. Or which animal foods I miss the most. Too be honest, it is not the actual food I miss ( because honestly my tastes have just changed), but the social ease of eating food with other people without being made a spectacle. Of course I have my list of my family staples that I no longer indulge in; fried egg sandwiches, cream of mushroom soup with grilled cheese, Costco rotisserie chickens picked off the bone, mega bowls of hidden valley ranch sour cream for dipping kettle chips in and tuna salad sandwiches. These tend to be the meals that I would classify as nostalgic family “eats” that bring back good memories. Until the other day….. I was in a gas station buying waters and I saw the packaged sandwiches, you know those nasty pre-made ham and swiss, tuna salads, and egg salad sandwiches with the crust cut off? The ones where you are genuinely concerned with how long they have been sitting there. 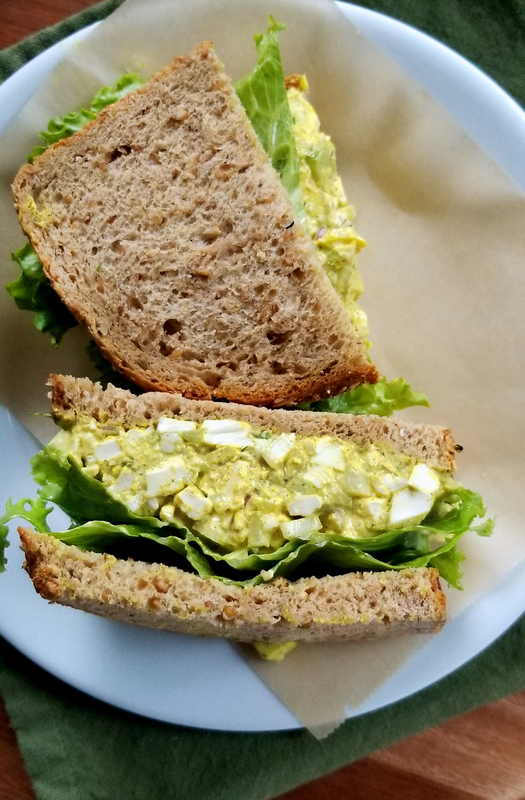 Well I don’t know what hit me ( I blame the baby ) but I got a huge rush of nostalgic memories of how much I LOVED EGG SALAD. If I think about it, I don’t think my mom actually ever made it frequently, but we had it enough for me to remember how much I loved hard-boiled eggs, deviled eggs, and anything smothered in mayonnaise. Once I left the gas station I was determined to recreate that gooey, eggy, slightly crunchy sandwich that apparently I loved as a kid. 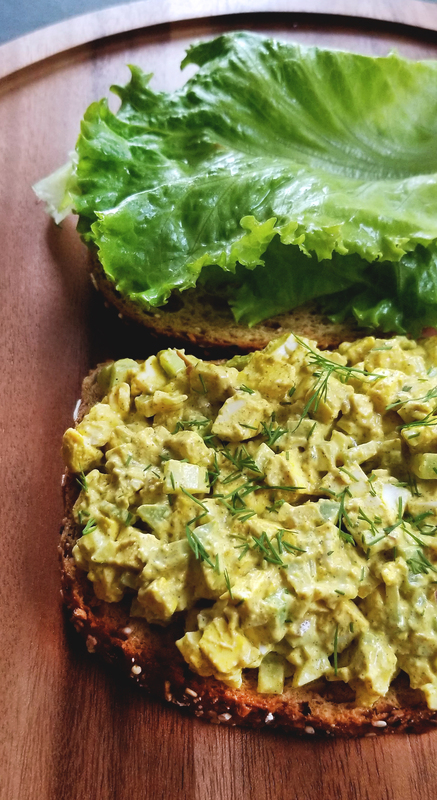 I wanted the same texture, flavor, and ease of smacking globs of salad between two pieces of sandwich bread and calling it a day. For the sauce, I tweaked all of the traditional flavors including lots of different mustard’s, a splash of vinegar, and the most important ingredient black salt. Combined with creamy hemp seeds, water, and some tapioca starch the sauce because just as creamy as mayo without all of the added oil. For the “eggs” I decided to use silken tofu. Silken tofu is kind that you find in traditional Japanese cuisine, most often in little cubes in your miso soup. 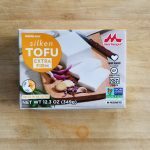 The texture is smoother (like silk) and more delicate compared to your typical Chinese tofu that you find packaged in water. Through some tinkering, I found that if you properly pressed the tofu, removing a majority of the water, the result was a texture very similar to hard boiled egg whites. 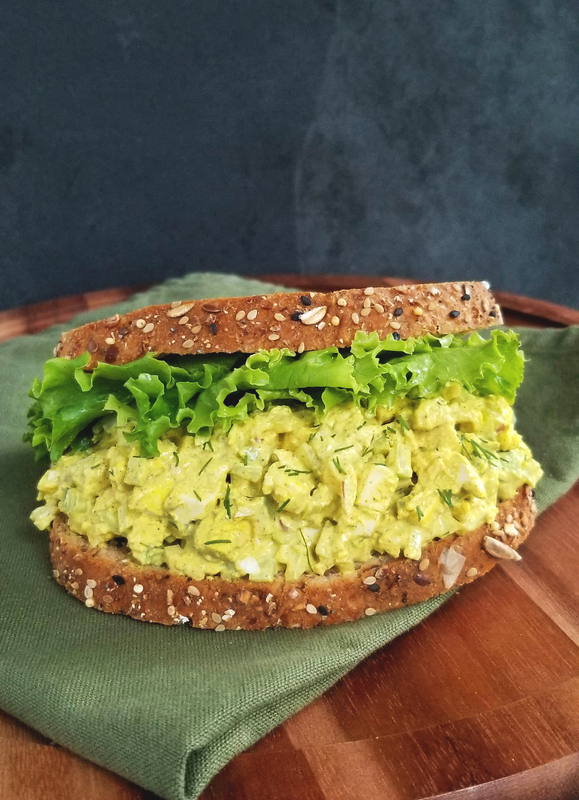 Using this technique of properly pressing the tofu, I was able to mimic the traditional texture of egg salad rather than create a mushy filling that tasted like egg salad. 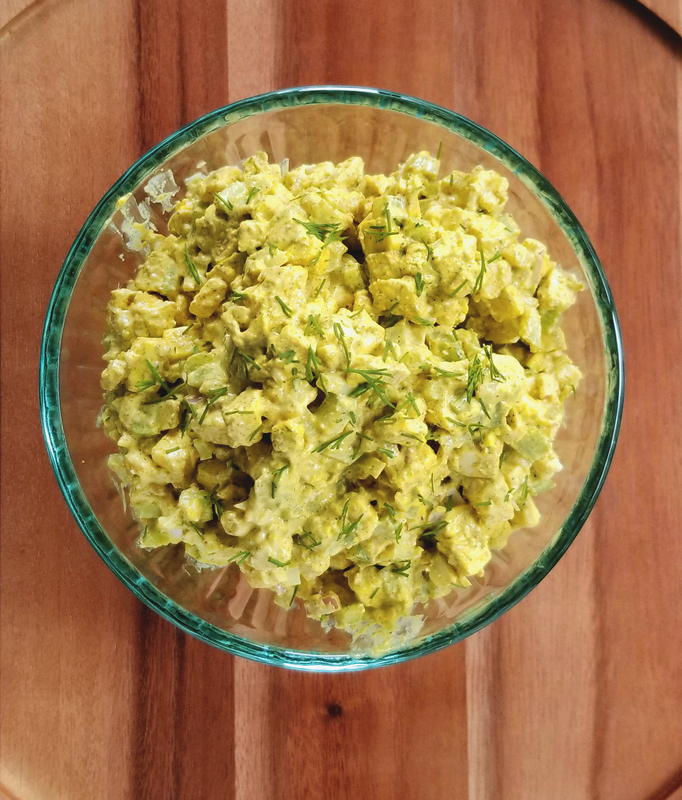 For a little more flavor, and some fun mimicry, I chose to marinate half of the cubed tofu in a turmeric and black salt past to create a deep yellow color on half of the “eggs” to visually replicate hard boiled egg yolks. 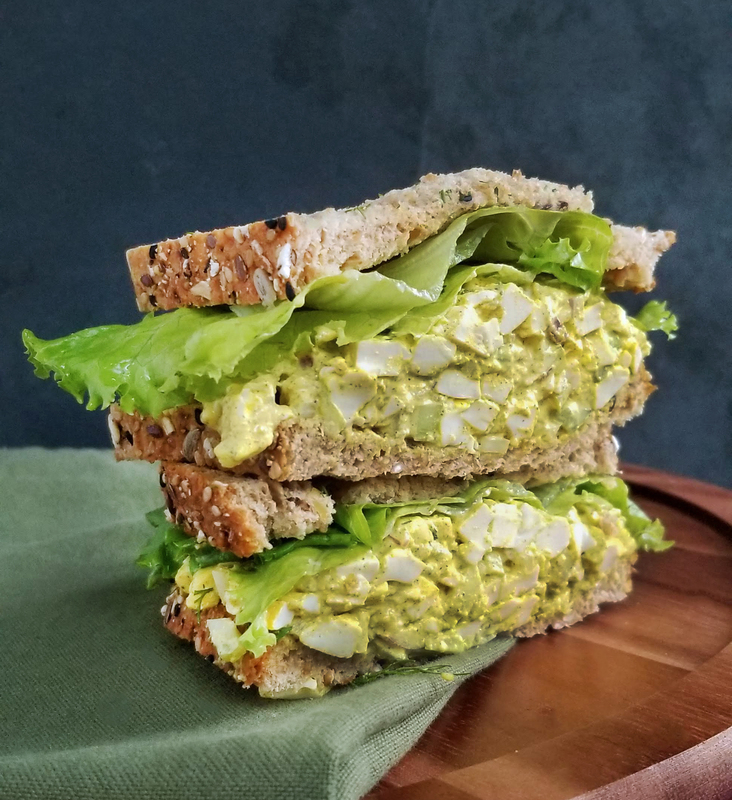 If you have been missing hard boiled eggs or creamy mayo based sandwiches, I hope this new twist on a classic brings you back to your childhood! Enjoy. 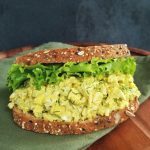 Creamy, savory, eggy, and slightly crunchy, this "egg" salad is indeed the salad from your childhood, that's actually good for you! (Morning) Carefully remove the tofu from the box trying to retain its shape as much as possible. 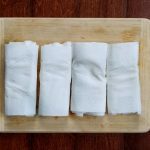 Slice it in half lengthwise and wrap the blocks in multiple layers of paper towels then wrapped in a dish towel. 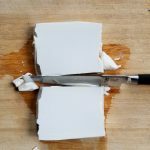 repeat this process with both block of tofu and leave in the refrigerator for at least 8 hours. (Night) Remove the moist towels and re-wrap one of the blocks to leave overnight. To the other block chop into small pieces and place into a small bowl. In a pinch bowl add 1/2 tsp. turmeric and 1/4 tsp. of black salt with 1/2 tsp of water to make a paste. Add this paste to half of the chopped tofu and mix to incorporate the color. Cover and let marinate in the fridge overnight. (Day 2) To make the sauce, add all of the sauce ingredients into a blender( preferably a small blender such as a magic bullet), and blend on high until smooth and creamy. Place in a small jar and let the flavors marinate overnight while the chopped tofu is also marinating. Remove the remaining tofu from the towels and chop into small pieces. 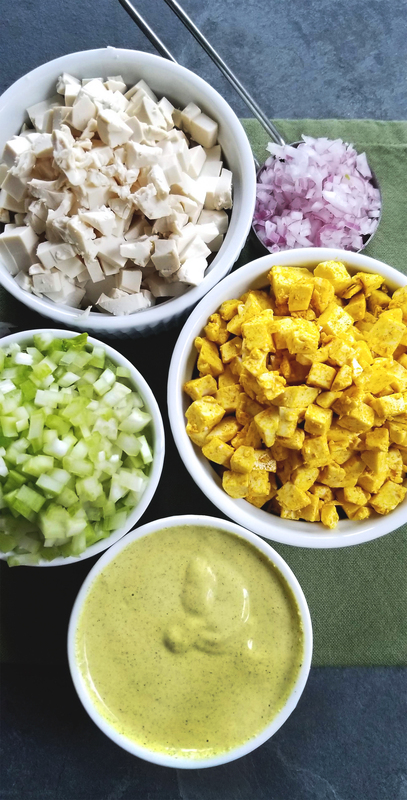 To a medium sized mixing bowl add the plain chopped tofu, the marinated chopped tofu, sauce, celery, and purple onion. Mix well until incorporated, the salad is now ready for sandwiches, crackers, or a spoon. 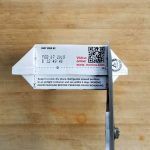 Store in an air-tight container for up to 4 days, the flavors will get stronger the longer it sits. Cut along the dotted lines on the wing tips, then again across the top. Repeat on the other side and slide out tofu in one whole block. 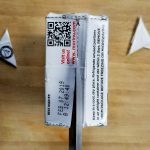 Slice lengthwise and wrap in paper towels. Set in refrigerator for 8 hours.